There are many lessons the incoming Trump administration can take away from how President Obama handled the Palestinian-Israeli peace process. Contrary to White House spin, the failure to produce any tangible progress or benefits over the last eight years is not the fault of Israel's prime minister, Benjamin Netanyahu. 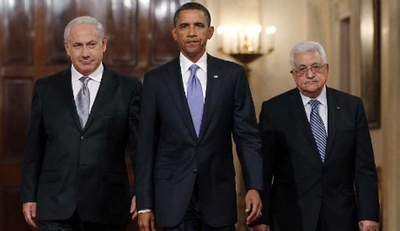 Rather, the fault lies in Mr. Obama's bizarre obsession with the Israeli settlement issue. As a result, the process stood still with the wheels constantly spinning. With a laser-like focus, he kept tilting his head to examine the single tree in a forest of other options that he refused to entertain. Rather than making steady progress—even on the margins—Obama instead became a prisoner of his own unalterable thinking. From the outset, he confused tactics for strategy by first believing that the key to brokering a peace agreement required leveling the playing field that he felt favored the Israelis. Secretary of State John Kerry explained the rationale: "People in Israel aren't waking up every day and wondering if tomorrow there'll be peace, because there is a sense of security and a sense of accomplishment and a sense of prosperity." Instead, he called for "strengthening" Palestinian Authority President Mahmoud Abbas. It was believed early on that one way to accomplish this was by calling for an Israeli settlement freeze as a precondition to negotiate. It was a gift to the Palestinians, as it had never been their demand previously. In 2000, President Clinton identified the five core issues of the conflict that needed to be resolved: territory, security arrangements, Jerusalem, refugees, and an end of claims agreement. What Mr. Obama did was take the issues of territory and Jerusalem and form a single, major juggernaut—settlements. Historically and sensibly, the question of Israeli settlements was addressed within the scope of the territory issue, while the status of Jerusalem remained separate. In a permanent status agreement, Palestinians assumed Israel would keep some settlements, especially in the neighborhoods around Jerusalem. In return, they expected Israel to offer compensation, usually in the form of a territorial land swap. Israeli settlements were not the obstacle in peace negotiations. That was true during the peace efforts in 2000 between Ehud Barak, Yasser Arafat, and President Clinton. It remained true in 2008 when Israeli prime minister, Ehud Olmert made another generous offer to the Palestinians that they rejected just months before Obama took office. The second crucial mistake the Obama administration made was disregarding a key presidential commitment to Israel that paved the way for Israel's 2005 withdrawal from Gaza. The 2004 Bush-Sharon exchange of letters took geographic reality into account and recognized that the "the outcome of final status negotiations" will not be "a full and complete return to the armistice lines of 1949" and "any final status agreement will only be achieved on the basis of mutually agreed changes that reflect these realities." As such, Israel could build within existing settlements confined to the existing lines marked for construction, but they could not create new settlements, which would require expropriating land. Therefore, it wouldn't affect the over 90 percent of West Bank land available for a Palestinian state. While the letters of assurance did not represent President Bush's overall endorsement of Israeli settlement policy, it removed the issue of settlements from the U.S.-Israeli relationship. President Obama, for his part, made the issue the centerpiece. Nevertheless, in November 2009, Obama got his wish. Netanyahu relented and agreed to an "unprecedented" 10-month freeze on building in settlements, excluding Jerusalem. Prior to that, the longest recorded Israeli settlement freeze occurred under Jimmy Carter and Menachem Begin in 1978, lasting three months. President Obama's dedication to this failed tactic was truly remarkable given that everybody lost. Instead of weakening Netanyahu domestically, it strengthened him as Obama's demand was seen as unreasonable. Accordingly, Obama's stock plummeted amongst Israelis. Nevertheless, it opened up a needless rift in the U.S.-Israeli relationship. It also didn't work as an inducement to Palestinians. In an interview with Newsweek in April 2011, Mahmoud Abbas explained: "It was Obama who suggested a full settlement freeze. I said O.K., I accept. We both went up the tree. After that, he came down with a ladder and he removed the ladder and said to me, jump." Despite Israel's concession, Abbas didn't show up to negotiate until the final month of the moratorium and then he asked for another extension as a reward. Obama began with a problem in how he conceptualized the issue and then he compounded it by refusing to change tactics once that approach failed operationally. It was as if he was stuck trying to re-invent the wheel. A first order of business for the Trump administration and Israel should be reinstating the 2004 Bush-Sharon understanding. It will go a long way towards avoiding costly misunderstandings in the bilateral relationship. The uncomfortable truth for a departing Obama administration is that the president has only himself to blame for the impasse in negotiations. And so another legacy Barack Obama will own. He will end his presidency having accomplished less in the pursuit of Palestinian-Israeli peace than any other president in nearly a half century. He will do so canceling prior U.S. presidents' commitments while curtailing the options of those in the future. He will end it as he began it, focusing on Israeli settlements, tilting his head at the same tree and punishing others for his missteps.